We’ve reached our first milestone of the offseason. MLB Trade Rumors released their arbitration estimates on Tuesday. With the first year of a rebuild in the books, and contention seemingly far in the future, it’s not a surprise the Royals list is thin and relatively uninspiring. All told, they have six arbitration eligible players on their roster. Odds are strong the club will non-tender most of this list. The Royals have close to $67 million committed to five players for 2019, but are reportedly dicing payroll into the $85 to $90 million territory. That means every dollar counts. Maurer’s claim to fame is last winter he became the first player on Dayton Moore’s watch to go all the way to the arbitration hearing. He lost. Still, he pocketed a cool sum of cash in a season he provided an 8.9 K/9, a 7.2 BB/9 and a 2.0 HR/9 while posting a -0.5 WARP. Really, pick your metric. He stunk up any ballpark where he took to the mound. He’s eligible for arbitration for the second time and is coming off the worst season of his career. In his best seasons, he’s a decent reliever. Averagish, if we can coin a term. In other words, he’s the kind of guy you sign in February as you’re in the final stages of piecing together a bullpen for a million or two and hope he can keep you in the game in the sixth inning. He’s not someone a rebuilding team needs to tender a contract to. The guess here is he’s non-tendered and picked up by a mid-level team early in spring training. There’s always one. Peralta’s contract makes this an interesting conversation. He signed last year to a one year deal with a club option for $3 million with a low $25,000 buyout. Peralta entered last season with just under five years of service time which means the Royals could decline the option, pay the buyout and proceed through the arbitration process. In other words, could Peralta get more than the $3 million coming to him by entering arbitration? MLB Trade Rumors takes the under. It’s not under by much, so is it worth it for the Royals to decline the option for a potential savings of around $200,000? Obviously, these are estimates so there’s no guarantee that Peralta would get the above amount. By the rate stats, Peralta wasn’t much better than Maurer: a 9.2 K/9, a 6.0 BB/9 and a 1.0 HR/9 along with a -0.5 WARP. But he saved 14 games for a team that lost 104 after spending almost half the season in the minors. Don’t forget in the arbitration process, counting stats like saves tip the scales rather disproportionately. He never blew a save, but pitched a clean inning in just four of his 14 opportunities. 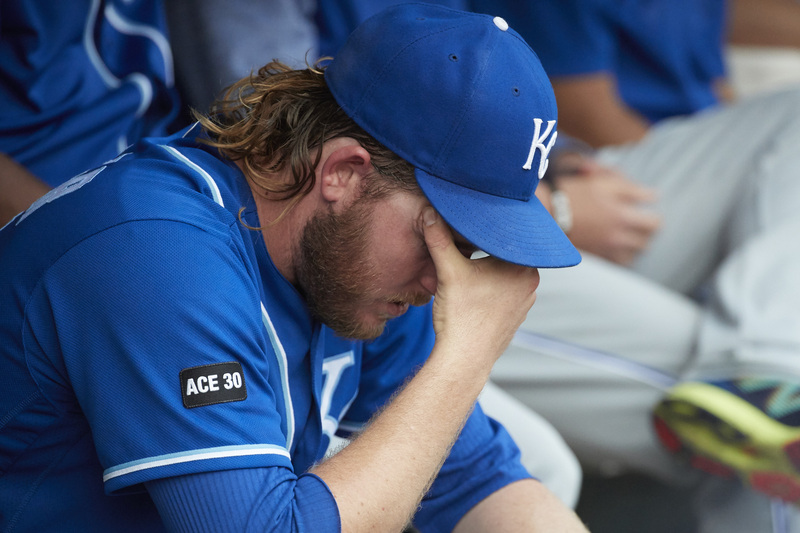 The Royals of the Allard Baird era probably would’ve non-tendered Peralta to save money. The Moore era is decidedly different where the team generally does the right thing. We can debate whether or not bringing Peralta back at that amount is a good move, but there’s a very small chance the Royals will go this route to save a few dollars. They will pick up his option for 2019 at $3 million. That’s quite a bump for a pitcher who threw only six innings in the minors last year. Hahn had surgery to repair his UCL sometime around early August with a timetable for his return estimated at around six months. If everything goes according to plan, he should be ready to go at the start of spring training. The Royals don’t have the luxury to wait to later in the rehab process to see how things are going. But health has always been a concern and he’s coming off unproven surgery for his injury. Plus, the most innings he’s ever thrown in a season is 115, back in 2014. He seems a candidate for a non-tender where the Royals negotiate a smaller contract with some incentives he could reach if healthy. All even for Karns who, like Hahn, had his season entirely short-circuited by injury. He had thoracic outlet surgery in July off 2017 and, after making a few appearances early in spring training, missed all of last year with an elbow injury. His stuff is tantalizing and his injury history is depressing. He’s another non-tender candidate who the Royals could bring back on a smaller deal as Karns needs to prove he’s healthy enough to get back on the field. We won’t blame you if you forgot about Cuthbert. He’s missed time over the last couple of seasons with foot, wrist and back issues. And when he’s been in the lineup… Ugh. Let’s just be kind to the infirm and say .215/.278/.313 over the last couple of seasons (and .252/.303/.378 in 830 career plate appearances) doesn’t get the job done. But the third base spot is up for grabs. Hunter Dozier didn’t play well enough to earn it for next year and there’s no one ready in the wings. The Royals could throw some money at Cuthbert and let him and Dozier battle it out. Plus, this estimate feels high given his injury history and lack of production. But when the estimate is already that low, we’re just quibbling over a couple thousand of dollars. Flynn is young, left-handed and has had decent success in the two seasons where he saw extended action out of the bullpen. At this price, he’s worth it to keep around for the bullpen depth. With a 5.6 K/9, a 4.2 BB/9 and 0.6 HR/9 last summer, he was the kind of reliever who you don’t necessarily want to give valuable innings to, but there’s still a place in a bullpen for someone like Flynn. The guess here is the Royals will tender him a contract for 2019. Assuming the Royals tender Flynn and exercise the option on Peralta, that would push the 2019 payroll to around $71 million for seven players. If we’re to believe the Royals are serious about bringing payroll down to under $90 million, that leaves at most $19 million for the remaining 18 players. It’s certainly doable, but that just sets up the offseason to be one of the most boring winters in recent memory.